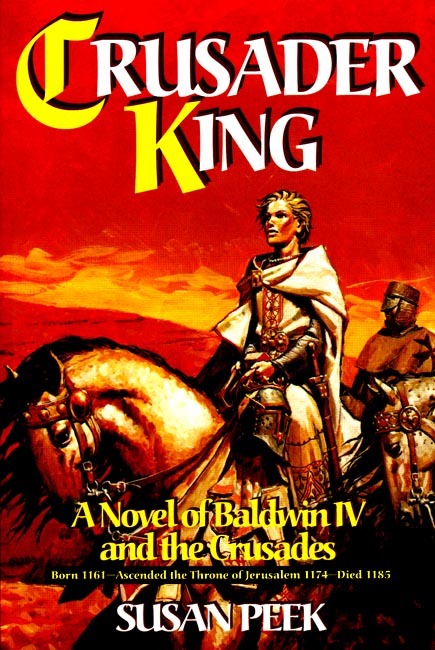 Crusader King This fast-paced novel recounts the life adventures and challenges of a young king, Baldwin IV, in the late 12th century as he fights in the Crusades to defend the Kingdom of Jerusalem against the Muslim Turks. Young King Baldwin IV battles not only the Turks, but the enemies within his own ranks, and the leprosy that has begun to attack his own body. Author, Susan Peek, has been a home schooling mom for 16 years, and has written this book for home schooling teens. A great read for teens and avid readers of all ages. Black and white. Copyright 2003. Soft cover. 193 pages. I've just finished reading "Crusader King" for at least the tenth time, and I can't think of any other book so enjoyable. (My son's friend said he has read it 18 times!) It's the true story of one of the most hidden heroes in the history of Christiandom, the brave young Leper-King Baldwin IV. The author did a wonderful job making this story appealing for young readers (ages about 12 to 16, although several adults I know have borrowed my copy and found themselves reading till two in the morning, crying their eyes out!) I can't see why this book is not better known. If you like a fast-paced read full of excitement, and very inspiring, you have to try this one. (Some bits are pretty "teen-agey" but the author obviously did that on purpose.) I don't think your kids will be disappointed.